A Farewell to Kings is the fifth studio album by Canadian rock band Rush, released on September 1, 1977 by Anthem Records in Canada and by Mercury Records in the United States. It was recorded at Rockfield Studios in Wales and was mixed at Advision Studios in London. Frontman Geddy Lee has said that the album was an important one for him, because "I learned a lot; I was learning a lot. I was always challenged and I was very stimulated and the end result was A Farewell to Kings, so I guess it was a pivotal record in that regard." In the Q & Mojo 2005 Classic Special Edition Pink Floyd & The Story of Prog Rock, the album came in sixth in a list of "40 Cosmic Rock Albums." AllMusic's Greg Prato gave the album 4 out of 5 stars, saying they "had improved their songwriting and strengthened their focus and musical approach." He took notice of the synthesizers that were creeping into the arrangements, "a direction the band would continue to pursue on future releases." Of Xanadu, he said "...remains an outstanding accomplishment all these years later". Conversely, Village Voice critic Robert Christgau gave the record a D rating, calling Rush "the most obnoxious band currently making a killing on the zonked teen circuit." He compared them to bands such as "Angel. Or Kansas. Or Uriah Heep, with vocals revved up an octave. Or two." The remaster has all of the original vinyl packaging, including the back cover (all black with puppet strings) and inner sleeve photos of the band on stage. The star with man logo was reinstated after its absence on the original CD issue. A Farewell to Kings was remastered again in 2011 by Andy VanDette as part of the three-volume "Sector" box sets, which re-released all of Rush's albums recorded for Mercury. In addition to the standard audio CD, A Farewell to Kings was also included on an audio DVD in the Sector 2 set, remixed into 5.1 surround sound. 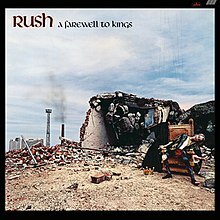 A Farewell to Kings was remastered for vinyl in 2015 by Sean Magee at Abbey Road Studios as a part of the official "12 Months of Rush" promotion. The high definition master prepared for this release was also made available for purchase in 24-bit/96 kHz and 24-bit/192 kHz formats, at several high-resolution audio online music stores. These masters have significantly less dynamic range compression than the 1997 remasters and the "Sector" remasters by Andy VanDette. Furthermore, it was remastered in 2017 and released for a fourth time, this time coupling it with the complete Hammersmith concert (which had partly been on Different Stages) and a selection of covers by Dream Theater and others. All lyrics written by Neil Peart, except where noted; all music composed by Alex Lifeson and Geddy Lee, except where noted. Terry Brown − spoken vocals on "Cygnus X-1"
^ a b "Allmusic review". AllMusic. Retrieved 20 September 2014. ^ a b Christgau, Robert (1981). "Consumer Guide '70s: R". Christgau's Record Guide: Rock Albums of the Seventies. Ticknor & Fields. ISBN 089919026X. Retrieved March 9, 2019 – via robertchristgau.com. ^ Thelen, Christopher (1999-04-16). "A Farewell To Kings". The Daily Vault. Retrieved 2012-07-31. ^ Thiessen, Christopher (2018-01-16). "A Farewell To Kings". PopMatters. Retrieved 2018-01-24. ^ "Rush: Album Guide". Rolling Stone. Retrieved 2013-02-21. ^ Jeffries, Neil. "Rush - A Farewell To Kings – 40th Anniversary album review". Classic Rock. Retrieved 5 December 2018. ^ "Andy VanDette On Remastering 15 Rush Albums". Themasterdiskrecord.com. Archived from the original on 23 August 2014. Retrieved 20 September 2014. ^ "Rush – new 2015 vinyl and hi-res reissues thread". Steve Hoffman Music Forums. Retrieved 10 July 2015. ^ "A Farewell To Kings 40th Anniversary Release". Rush.com. Retrieved 26 January 2018. ^ "A Farewell to Kings chart position in the US". Billboard. ^ "Rush chart positions in the UK". The Official Charts Company.